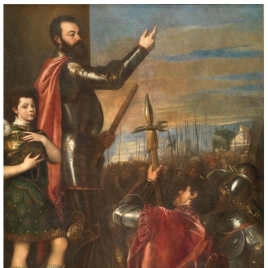 Charles V commissioned The Glory from Titian during their meeting in Augsburg in 1550-51. 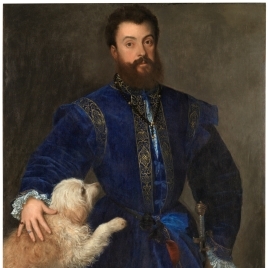 The painting was completed in October 1554 and was sent to Brussels. The unusual composition, which must correspond to precise instructions on the part of the emperor, as Gronau noted, is presided over by the Trinity, with the Virgin and behind her Saint John the Baptist -theologically the two principal intercessors- on the right. The importance of the Virgin in comparison to the other figures is indicated both compositionally and with regard to colour, as she is the only figure that walks towards the Trinity rather than looking expectantly at it, and she is also wearing the same blue as God the Father and God the Son. Below her we can recognise various figures from the Old Testament by their attributes, including Adam and Eve, Noah, Moses, David and Ezekiel, while the female figure seen from behind in the foreground has been identified as the Eritrean Sibyl, Mary Magdalen and even as a personification of the Catholic Church. To the left of the Trinity, on the viewer´s right, angels with palms accompany members of the imperial family who are barefoot and wrapped in shrouds, posed in supplicating attitudes. Charles has the imperial crown next to him and is next to his deceased wife Isabella, while behind and slightly below are his children Philip and Joanna and his sisters Leonora and Mary. 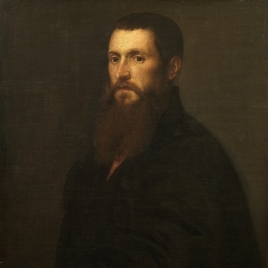 On a lower level are two elderly bearded men identified as Pietro Aretino and Titian himself in profile. 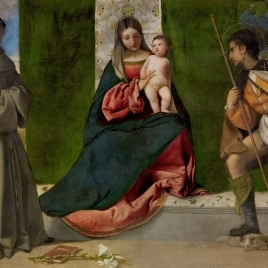 Also included was Francisco de Vargas, Spanish ambassador to Venice, who is probably the bearded figure below the Virgin. The earthly level is occupied by a bucolic landscape with a scene which Harbison incorrectly identified as the martyrdom of Saint Peter of Verona. However, to judge from their staffs, the small figures surprised by the grandiose spectacle above them, are pilgrims. 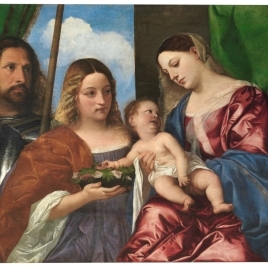 Despite their small scale, these figures are extremely important as witnesses to what is happening, establishing a connection between the earthly realm and the heavenly one which is absent in the works by Lorenzo Lotto and Albrecht Dürer which are usually cited as precedents to The Glory. The painting´s meaning is difficult to establish. Aretino, Vasari and Charles V´s inventory refer to it as The Trinity, but in the emperor´s codicil it is entitled a Last Judgement. 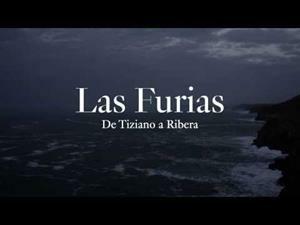 Sigüenza also gives it this title in his account of the death of Charles at Yuste, but then calls it La Gloria when referring to its move to the Escorial. 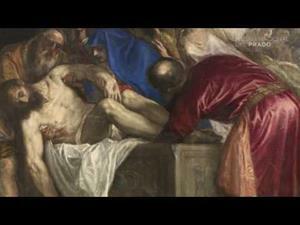 We can therefore conclude that this painting is open to various readings and that although it might initially be considered a visual representation of the Trinitarian orthodoxy of the Habsburgs, it acquires a devotional character when we consider that Charles contemplated it while he was dying, which would explain why it was called a Last Judgement when in fact it is not one. In fact, the painting represents the personal judgement of Charles, as the Venetian Inquisitor Valeria Faenzi realised when he authorised the reproduction of the painting in the form of a print by Cornelis Cart in 1567, stating that it depicted the emperor´s hopes for eternal salvation. 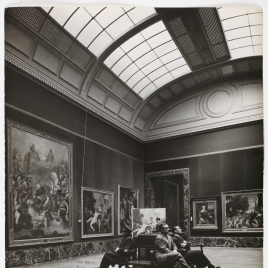 The painting also allows for a political reading. It is significant that along with the family members whom Charles wished to present to the Trinity, there are others notable by their absence, such as his brother Ferdinand and his nephew Maximilian, presumably left out as a result of the crisis that developed between Philip and Ferdinand with regard to the imperial succession during the meeting at Augsburg in 1550-51 when this painting was commissioned. The textual source for the work is a passage from the last book of Saint Augustine´s De Civitate Dei which narrates the celestial vision of the blessed, often represented by northern artists´ and whose presence at the imperial court is proved by the gloss which Fray Luis de Granada wrote on it in his Segunda parte de la Guia de pecadores (1556). 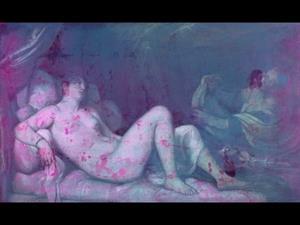 The rising movement of the painting, from the earthly realm to the heavens, finds its parallel in the technique deployed. As we move higher up, the figures become less solid and the paint application lighter, leaving the prepared ground visible. Aside from these effects, the quality of the painting is uneven. 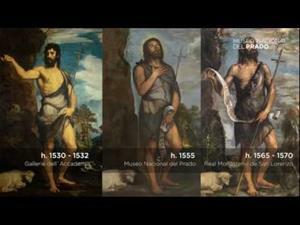 Alongside splendid figures such as the David and Moses, which are among Titian´s best in their monumentality, others indicate the intervention of assistants, particularly evident in the middle and upper zones of the composition. The portraits of the royal family are particularly weak, including the emperor´s. 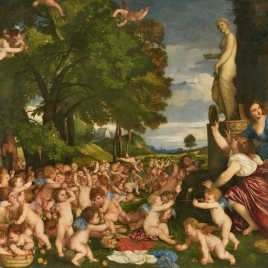 However, even the figures in the foreground which are undoubtedly by Titian are problematic. This is true of Noah, whose anatomical sense was sacrificed in favour of greater narrative clarity. 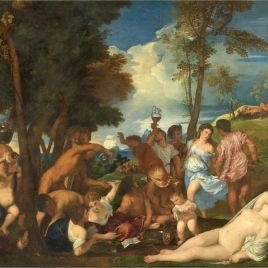 In order to separate the bodies of Noah and Moses, Titian introduced a brushstroke of blue sky between them, clearly applied over the already painted back of Noah which is thus reduced to an inappropriate size for his scale. The desire to define the planes explains the heavy silhouette of the female figure in the foreground. Her appearance and green robes bring this figure extremely close to the Saint Margaret. The painting was in the Aula de Moral of the Escorial from at least 1566. 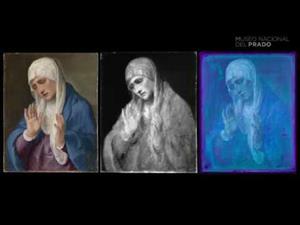 It entered the Museo del Prado in 1837. Height: 346 cm. ; Width: 240 cm. Palm leaf: Las palmas son portadas por ángeles que acompañan a los miembros de la familia imperial.